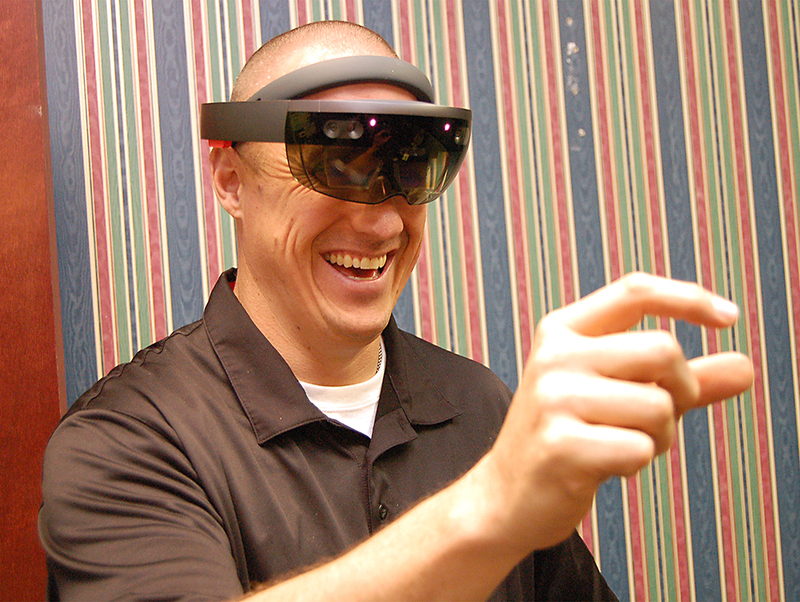 Wearing the high-tech HoloLens, Roane State director of EMS programs David Blevins manipulates a hologram as part of a cutting-edge program that's being used as a new way of teaching students studying anatomy and physiology. KNOXVILLE – Picture this: a high-resolution cross-section of a beating human heart floating in space, allowing for an up-close, interactive examination. Welcome to the world of virtual, augmented, and mixed reality as they are now being introduced into the Roane State Community College curriculum for emergency medical services. Instructors at the college’s Knox County Center for Health Sciences are participating in a pilot study with the assistance from the college’s Center for Teaching Arts and Technology. Several technologies are currently being utilized in order to introduce and expose students in the EMS program to the world of virtual reality. VR headsets with hand controllers, a Ricoh 360 degree video camera, and the Microsoft HoloLens were purchased to facilitate the process of integrating these new technologies into the existing curriculum. The Ricoh 360-degree video camera allows faculty to create a 360-degree video of real life locations and situations. A virtual reality headset then uses those videos to immerse the user in a three-dimensional environment. The Microsoft HoloLens is a mixed reality headset that engages through holographic, three-dimensional interactive images. These images can be moved and altered with two-fingered tweaks by the HoloLens headset wearer. "These technologies are providing Roane State students with a more engaging and realistic learning experience," said David S. Blevins, director of EMS programs. 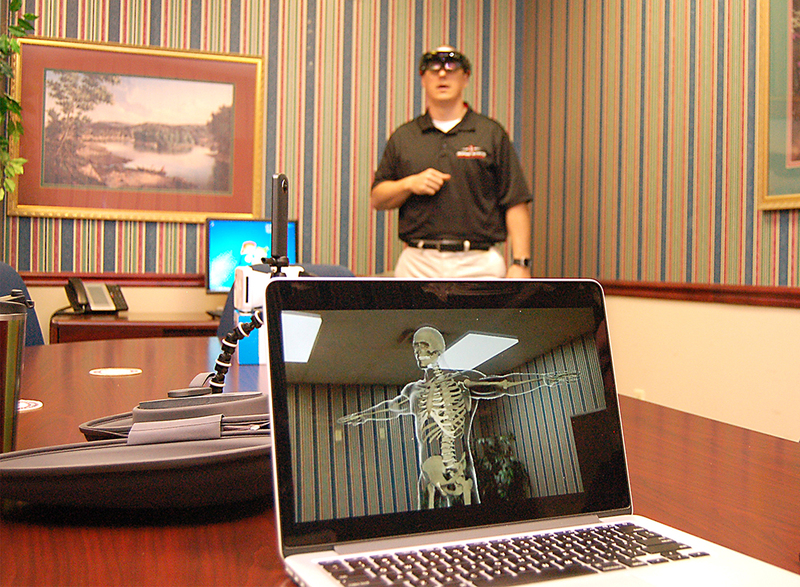 A holographic image of a human skeleton appears on a laptop computer while it's being controlled by David Blevins, in background, director of EMS programs at Roane State Community College. These new environments are being utilized in all levels of EMS related education. It allows students to view a staged accident scene and then describe the proper response scenario. With the HoloLens, students can see a 3-D holographic model of the human anatomy. That allows them to view flesh, muscle, bone, and all organs of the human body. The headset wearer has the option to change the views so interaction, collaboration, and discussion can become seamless in the classroom. “The students were amazed,” said Thomas Herron, a Roane State assistant professor and clinical coordinator at the center. “It’s a supplemental way of teaching." Stephanie Moskal, Instructional Design Specialist and Dr. Susan Sutton, Director of the Center for Teaching Arts and Technology, worked with Mark Bodine, instructor in the paramedic program, to research and test the use of virtual and augmented reality devices. Once the most appropriate devices were selected and purchased, the Center for Teaching Arts and Technology worked with the program’s faculty on using the new technologies in their classrooms. Herron is upbeat about these new frontiers in education. “As an educator, it’s wonderful knowing our administration is so proactive in providing this technology and putting it in our hands,” he said. To learn more about Roane State’s EMT and paramedic programs, contact David Blevins at (865) 354-3000 ext. 4768 or blevinsds@roanestate.edu.